Scapes are the edible flower stalks of garlic and onion plants. 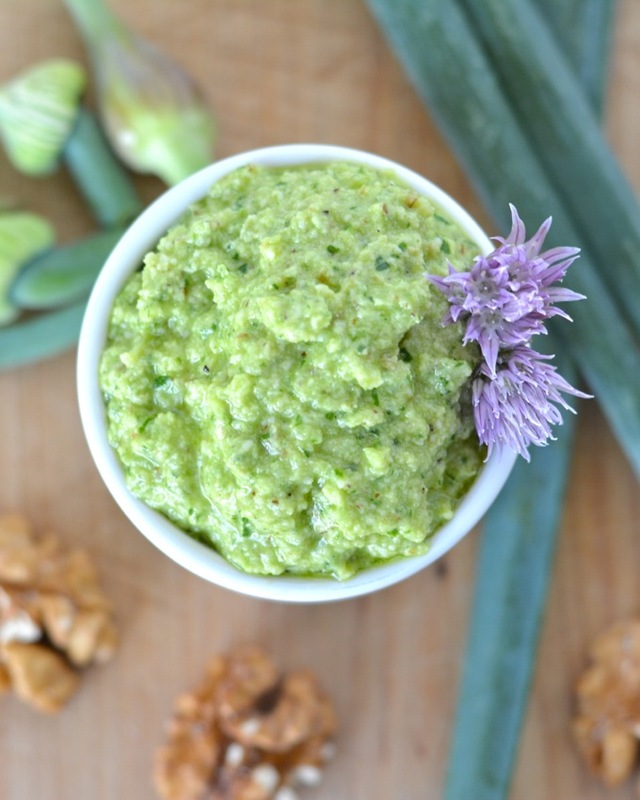 This Garlic Scape Pesto combines scapes with walnuts, olive oil and Parmesan for a fresh, garlicky version of traditional pesto! Happy Harvest Friday! Today’s post is going to be a little bit different than usual. I was out of town all this week, so I didn’t have a chance to check on the garden too much and don’t have many updates. 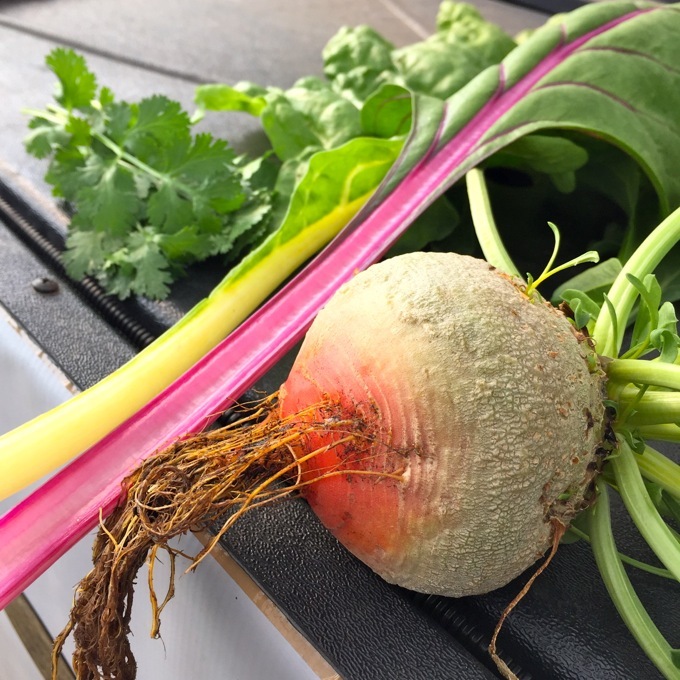 BUT since I don’t have updates for you, I’ve got a delicious garden-fresh recipe for you instead. Before I get to the recipe, I do have one little update. Remember how we finally got some tilapia? Welp… We won’t be eating those tilapia. Guys!! Why are these dang fish giving us such issues?! Ha! We installed an automatic fish feeder since we were gone last weekend, and the feeder fed the fish a little too much for a couple days. This messed up our water levels a bit, so we cut back on the food for the next few days. Well apparently the carp got really hungry because they ate all our tilapia AND our goldfish! Those jerks. Since we clearly know nothing about fish, we decided that for now we are just going to stick with goldfish. We took the carp out of the system and added 50 new goldfish. Hopefully we’ll eventually get tilapia again, but for now we’re just going to worry mainly about the produce. I did document a few harvests before I left town. 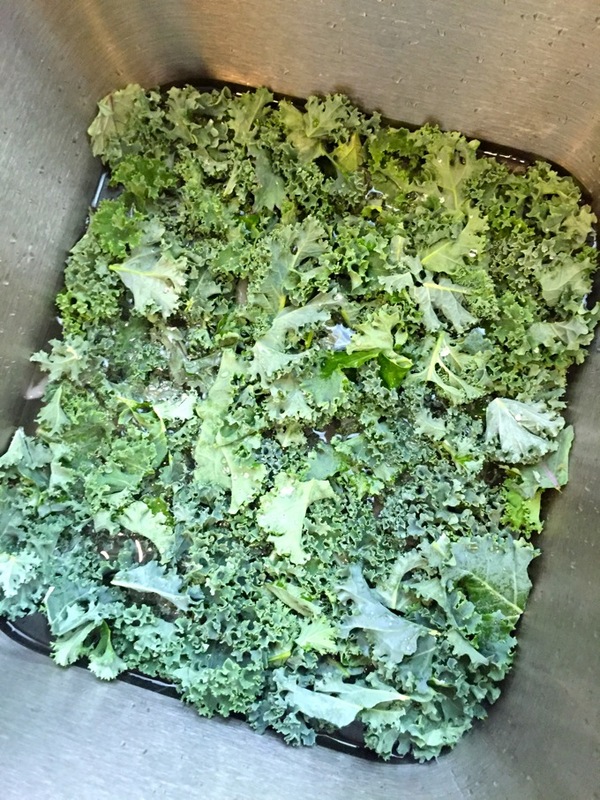 After discovering how amazing kale chips are, I picked a whole bunch more and made another batch. Our chard is HUGE. The leaves are bigger than my head! These ginormous leaves went into a quail egg omelet. 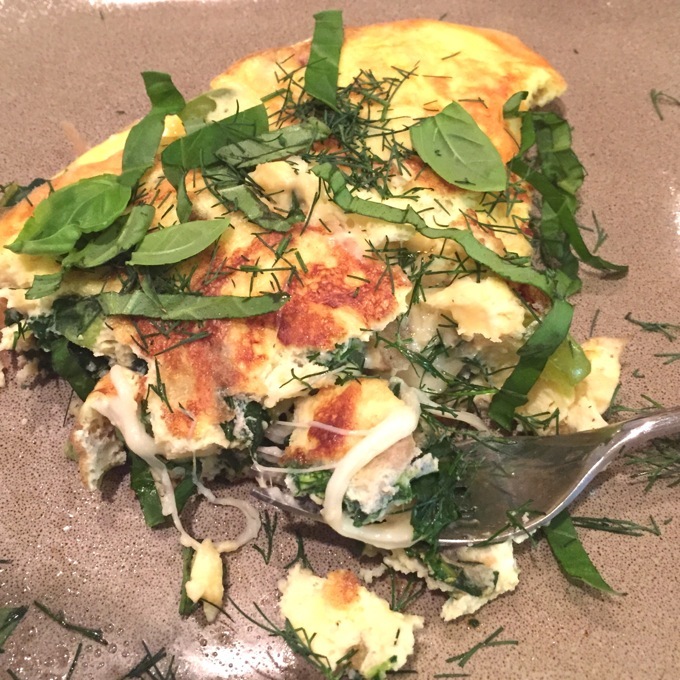 Which was garnished with garden-fresh dill and basil. Seriously so amazing. I am LOVING the dill. 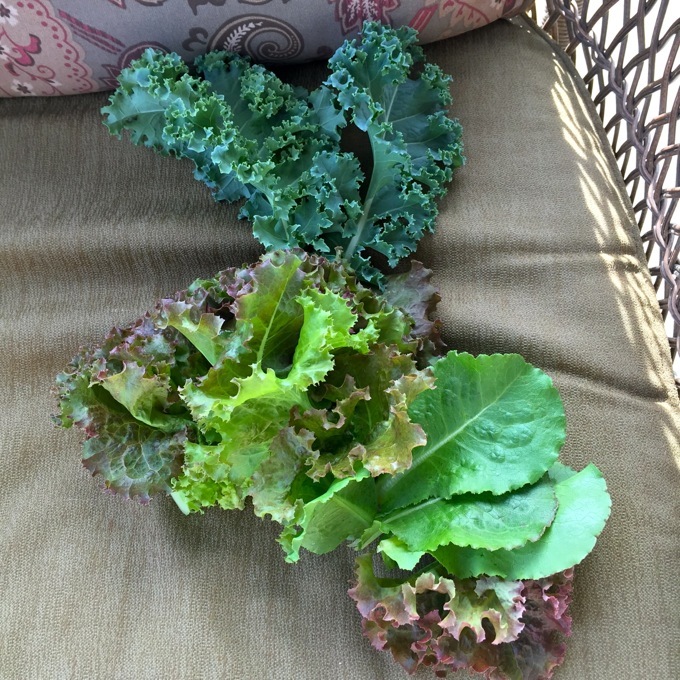 A few more kales and some lettuce became a salad. This golden beet went in a salad, too. The chard went into a batch of enchiladas (which ended up being a cross between my Green Chile and Chard Enchiladas and Vegan Kale and Black Bean Enchiladas), and the cilantro went on top. 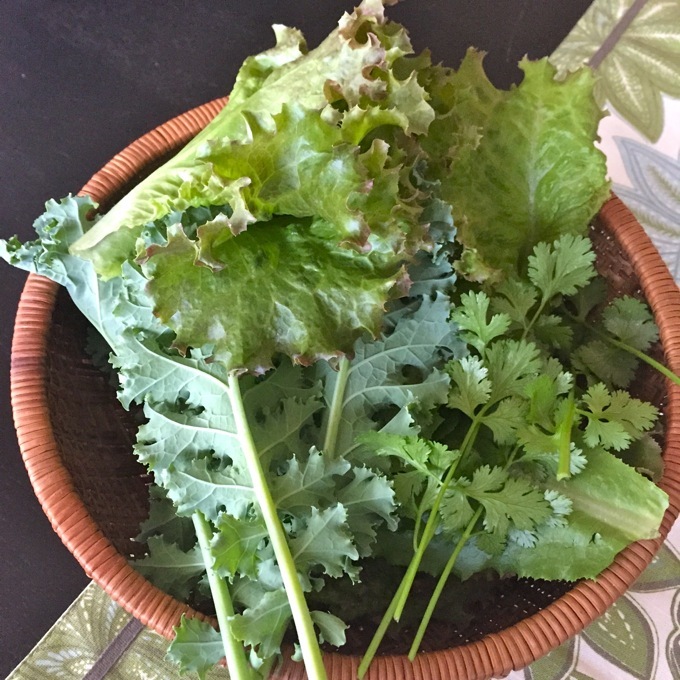 Lastly, one more salad with kale, lettuce, and cilantro. So now let’s talk recipe. In my last garden update, I mentioned the garlic and onion scapes that I harvested. I wasn’t sure what to do with them, so I went to my trusty all-things-garden-and-veggie cookbook Vegetable Literacy by Deborah Madison. I found a recipe for Garlic Scape Pesto and it sounded like the perfect idea. What I’m learning about random garden veggies: when in doubt, make pesto! Place scapes and walnuts in a food processor and pulse to break them up. With the motor running, slowly drizzle in the olive oil until the mixture is smooth. Add the Parmesan, season with salt and pepper, and pulse a few times to mix. I tossed some pasta in my pesto, but Deborah also suggests stirring it into soups or spreading it on crostinis. If you have onions or garlic in your garden, definitely be sure to take advantage of your scapes! You can also probably find them at a lot of farmer’s markets this time of year. Ours just opened last week, so I can’t wait to get a chance to go. 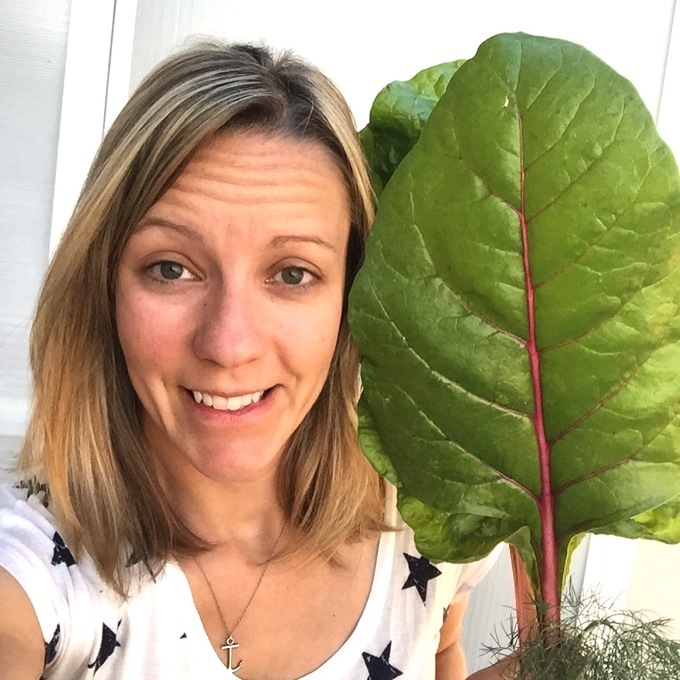 Harvest Fridays - Drink your veggies! Yum! That sounds great! 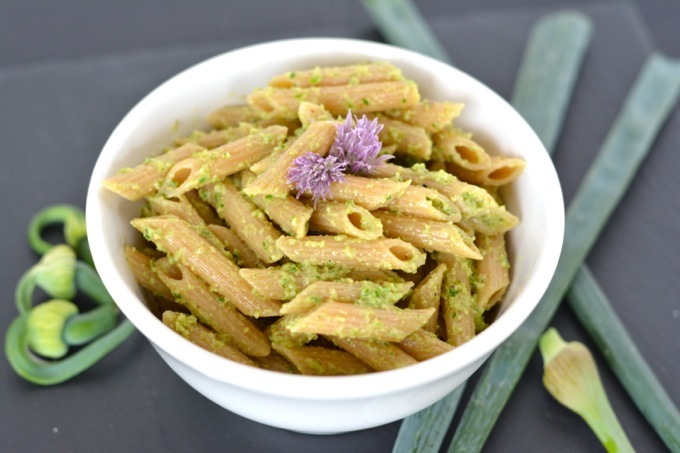 I have a chive pesto recipe I’ve been meaning to try…my chives are out of control and we’ve gifted so many to others but there’s way more than I can ever use. Oh my gosh, my chive plant is crazy too. It’s 3 years old now and now I have little chive plants popping up all around it, too! Just went you thought you had the tilapia under control, right? 🙂 This pesto looks amazing, Jess! I’ve never heard of scape before, but I love how you used it in this dish. I think I would eat this pesto on just about anything! I know!! Stinkin tilapia! We’re giving up for now, LOL, but hopefully some day we can get some more! Gosh you guys are so awesome! I am so jealous of your fresh produce! I can’t wait to try this pesto, it looks amazing! I love a good homemade pesto. Your recipe looks amazing! I love all the yummy garlic you add to it! This pesto sounds amazing, Jess! 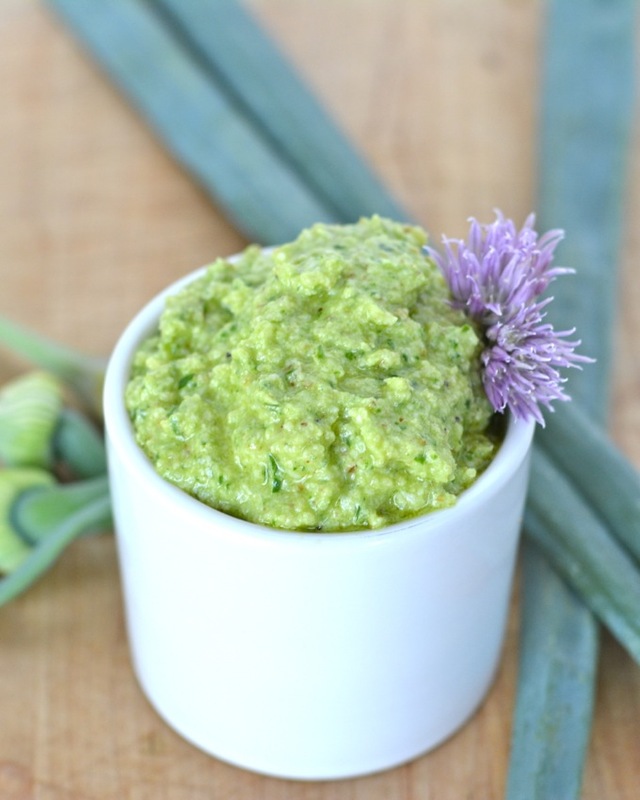 I love pesto in any shape or form (ahem, I just posted one today too…haha). I’ve yet to try this variety and I can’t wait to! Oh no! The carp ate your tilapia! Seems like getting them was such a headache, and now they’re gone! Hugs friend! I love this garlic scape pesto. Yum! Jess, I am loving the look of this pesto! Yum! I have yet to have (ever) made pesto, and this is a reminder (again) that I need too! BTW, I did not know this –>”Scapes are the edible flower stalks of garlic and onion plants.” So, thanks for educating me! Thanks, Kristi! I’m definitely learning a lot about plants and veggies as I go, too! This pesto looks amazing Jess! This is so creative! I love it! I have probably mentioned this before, but I am so jealous of your garden……I want one so bad. Darn you apartment life!!! Sorry to hear your carp ate the tilapia! Love this pesto though! The garlic scape sounds fantastic and your garden is just amazing! Thanks, Kelly! It was such a fresh, yummy pesto!